The active learning community built around text has a long-lasting influence in how our students see themselves as learners and thinkers. The Reading Apprenticeship framework provides a wide variety of on-ramps for students to see their academic texts in new and different ways. Faculty work to ensure that the social, personal, cognitive, and knowledge-building domains are at work so that the students can bring their own knowledge to the texts. This approach to reading challenging materials is collaborative and brings students into the circle as expert readers in their fields. Since 2009, our faculty have been working on improving their pedagogical craft with texts; rather than assigning and testing, we tend to be mindful and intentional of what and why we are assigning texts to students. The result has been more engaged readers, critical thinkers, and student persistence in our classes and programs. Renton Technical College first began using WestEd's Reading Apprenticeship (RA) in July 2008. The RA support group at RTC is affectionately known as RATs (Reading Apprenticeship Teachers and supporters). Reading Apprenticeship continues to draw attention as more and more faculty and administrators around the region want to learn more about this framework for increasing comprehension, fluency, and stamina for student reading in disciplinary texts. WestEd’s Strategic Literacy Initiative has named Michele Lesmeister as the state coordinator for Reading Apprenticeship trainings within the state of Washington. Michele is working with the Office of Adult Literacy to provide training across the state in Reading Apprenticeship for faculty and staff who wish to learn more. There will be five sessions between July and December 2015. To enroll for one of these sessions, faculty will see their dean or supervisor to learn how to enroll. In this capacity, Michele is working with the other state leaders to bring Reading Apprenticeship training to campuses, network around reading in the community colleges, and help faculty and staff access more training from WestEd. The Metacognition & Mindfulness: Academic Literacies for the 21st Century - Regional Reading Apprenticeship Conference drew 250 educators, administrators, librarians, and volunteers together on March 14, 2015. The conference helped the attendees to build community and learn new approaches for the classroom. The next conference will be March 8 and 9, 2019, more information will be available in Fall 2018. Michele is currently working to build Reading Apprenticeship mentors on our campus. She will provide ways for a small group of instructors who use Reading Apprenticeship to build their leadership skills in Reading Apprenticeship and help spread the framework to new and current faculty on campus. The RATs website contains RA templates to use in your classroom, lists of RA-related library materials and links to websites and workshops. RTC has made a commitment to help all full and part time faculty who would like to learn about Reading Apprenticeship an opportunity to do so. RA lead Michele Lesmeister has put together a repository for pedagogical support, classroom ideas, and faculty support which can be found here. 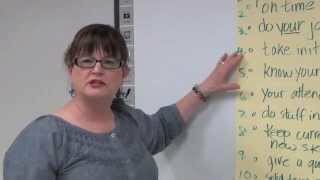 The RTC playlist of short videos featuring Michele Lesmeister and showing Reading Apprenticeship in action in the classroom can be found here.